Victorian paste, garnets, silver brooch. In Fine Jewelry > Paste Jewelry > Show & Tell and Fine Jewelry > Victorian and Edwardian Jewelry > Show & Tell. 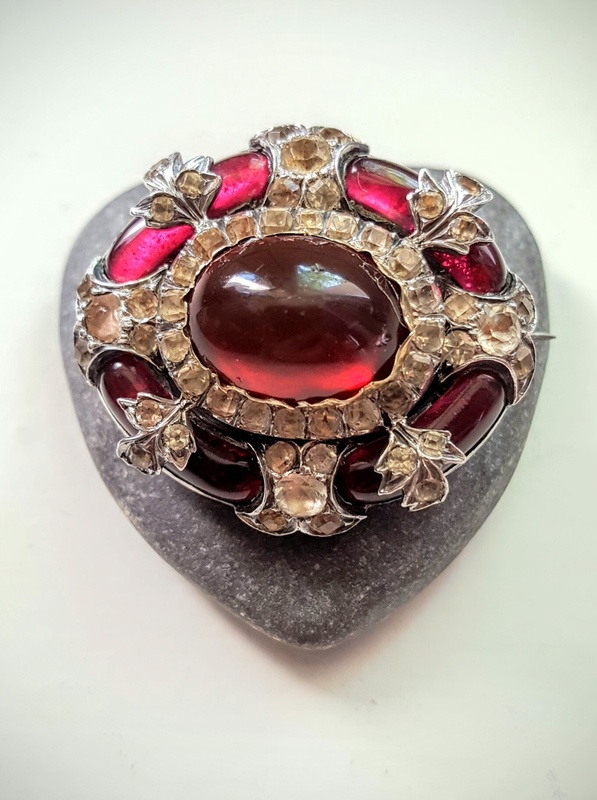 I really love carbuncle/almandine garnets! The center is red glass, but the edges are (in my opinion!) almandine garnets. The center setting is gold color (gold? ), silver is unmarked. I place it in 1860's era. 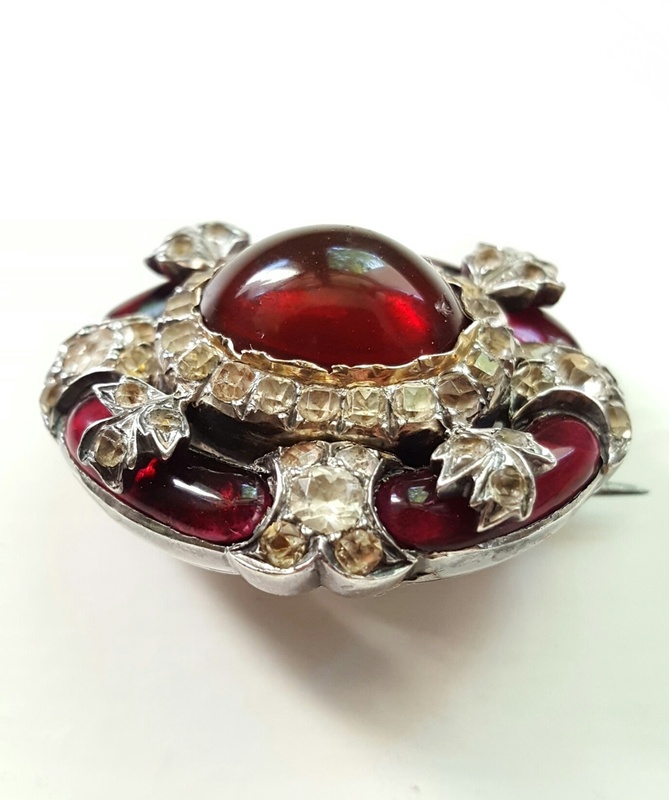 This is a beautiful brooch!!! Fleafinder, lol, I'm rock hearted ;-) Thank you! Mike, thank you my friend! Thaks too for your loves, Thomas and Nevada! Pops, so kind comment! Thank you !!! I'm very happy you love it too, thank you for your enthusiastic comment ! As you, dear Mani! Thank you, lot of XO! Such a beautiful brooch. Very stunning!! BTW, I love your profile pic. 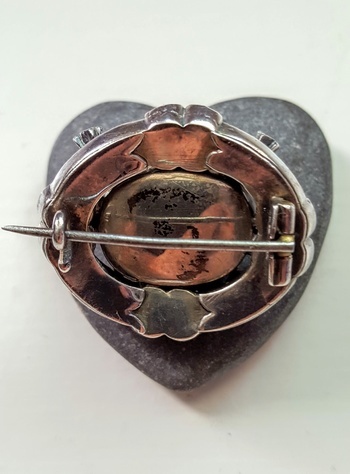 The brooch is so wonderful in every way! The color and the large domed paste centre stone! Wow! Elisabethan, thank you so much for the wow comment! Many, many thanks to all of you, 21 lovers! David... XOXO! I wouldn't be able to resist it, either. Alan, great thanks to you for your WOW comment! Davyd, I must say I'm very low on the resistance scale when it comes to antique jewellery.... ;-) Thank you!!! Huge collective thanks to all 31 friends lovers! A stunning piece! 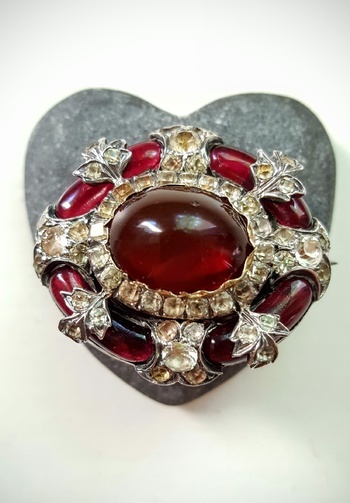 I love garnets, too!